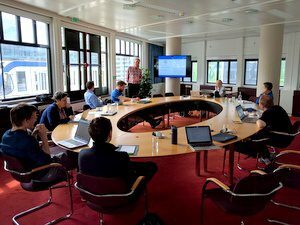 Our Annual General Meeting took place on 1-2 June at the Koninklijke Bibliotheek in The Hague. The board of directors held their monthly meeting in the morning, approving two new membership applications from Arkivum, and the National Library of Norway who joined us for the AGM. Chair of the board Dr. Ross King, AIT Austrian Institute of Technology welcomed the members and declared the meeting open. We’ve had six new members join the Foundation over the past year so started the day with introductions. Due to an unexpected fire alarm we extended our getting to know one another session with a brief trip outside. On our return, Joachim presented the Foundation’s activities from the past year. All members received a copy of the new Annual Report 2014 – 2016. The meeting split into two parallel tracks: managerial and technical. Official business of the meeting was next on the agenda. Dr. Adam Farquhar of the British Library, and founder of the Open Preservation Foundation, retired from the board of directors after six years. He was chair from 2010 – 2013. Bjarne Andersen of Statsbiblioteket also retired. He too has served on the board since the Foundation was established, and he held the position of financial officer for the past three years. Lauri Leht takes over the role of financial officer. Ross thanked Adam and Bjarne for their contribution and guidance. Ross retired by rotation and was unanimously re-elected by the members. Dr. Peter May, British Library, was nominated to join the Board of Directors. The members unanimously agreed on his appointment. Members then worked in groups to review our activities against the Strategic Plan 2015-18 and provide feedback on ways we can improve. Participants in the technical track presented their current work and discussed opportunities for collaboration. The two tracks joined together to hear presentations from the Foundation’s affiliate members who provide technical effort as part of their membership agreement. 1 June marked the Foundation’s sixth birthday. 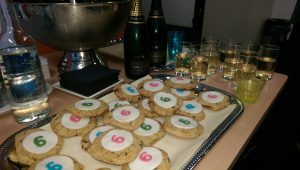 We ended the day with fizz and cookies to celebrate. The agenda for the second day focused on discussing member needs, introducing new initiatives and agreeing priorities for the year ahead. The managerial track started with a session on implementing digital preservation. This session aimed to bring members together to share their experiences. Some members were early adopters of digital preservation, and are now working on a new system, others are just getting started. We asked organisations to prepare six questions, or six lessons learned in advance. The discussion was documented in the minutes. Topics covered during the day included opportunities for our cultural heritage and vendor members to work together, sustainability, projects and our Annual Plan 2016-17. The technical track looked at use of FOSS (Free and Open Source Software) amongst our members, best practice, improving software delivery and planning for the year ahead. At the end of the day Carl reported back on the discussions and actions from the technical track. Thanks to all our members for attending – we appreciate your input and feedback!